The Englishman’s reverence for the modern notion of chivalry, which is summed up by the tag ‘play the game’, is inculcated upon him at school, and it makes him an easy victim of his female circle. There is nothing more admirable than a chivalrous spirit—that spirit which arose in Europe in feudal times, and which makes it incumbent upon the superior and the stronger to protect the weaker from all molestation and assault, and to meet for him or her all difficulties with which the weaker cannot reasonably be expected to cope. And it would be an excellent thing if chivalry in this sense were more widely practiced. Per­haps the finest exponents of chivalry in the whole world were the old Maoris of New Zealand, who would never continue a fight if their op­ponent were at the slightest disadvantage from the lack of food or wa­ter, or from inability through lack of time to collect and tend their wounded. How this chivalry on the part of the Maoris was exploited by English settlers does not constitute the finest page in the history of the Empire. But this is another matter. Suffice it to say that the tradition of chivalry exists wherever feudalism once prevailed, and its very essence is to thwart and resist that bullying propensity in the powerful which tends to victimize individuals or groups who have momentarily no means of protection or who are in any way at a disadvantage. The spirit which caused Pope Innocent II in the reign of Stephen to prohibit the use of the arbalest as ‘a barbarous weapon unfit for Christian warfare’; which led Charles V in 1376 to celebrate the memory of the Black Prince in a solemn service, although the latter was his bitter and successful enemy; and which made Robert of Normandy refuse to besiege one castle when the besieged were waterless and another when Henry I’s queen was in childbed inside it—this spirit may be said to be quite extinct. For many years now European nations have thought nothing of slaughtering, with all the terrible weapons of modern warfare, savages who were armed only with spears and bows and arrows, and no civilized nation during the last hundred years at least has scrupled to take advantage of an opponent’s momentary bad fortune, or disadvantage in the matter of munitions or water or food, in order to crush him. And the same is true, more or less, of social life within the various states. To be undefended is, as a rule, to be victimized. Think, for instance, of the treatment of the women and children in the early days of the nineteenth century in the mines and mills of the north of England. While publicly England fought for the emancipation of the slaves in America, her own women and children were working in chains underground. In social life too, therefore, we may say that the spirit of chivalry is dead. The ex­ploitation of the weak—I do not mean the sick; that is another matter—goes on interruptedly day after day. There is, however, a curious survival of the idea of chivalry which is at once a distortion and a travesty of its original character, and that is the belief which prevails in certain classes that it is not ‘chivalrous’ for a man to have his way with a woman. Truth to tell, however, if a man is to hold himself responsible for the woman who is his mate, he must at times ‘have his way’, for a man cannot be held responsible for someone whom he cannot guide: that is elementary. The Alpine guide soon points out to a recalcitrant tourist that only if he falls in with the rest of the party and does not stray—that is to say, only if he follows the guide—can the latter be responsible for him. And the same holds good all through life. Now, it is obviously the chivalrous thing for a man to hold himself responsible for his womenfolk. To decline responsibility here is to do precisely what the knight of old least wished to do. Chivalry was the responsible side of feudalism. But how can a man make himself responsible without occasionally, at least on matters where his responsi­bility is likely to be called to account, having his way? 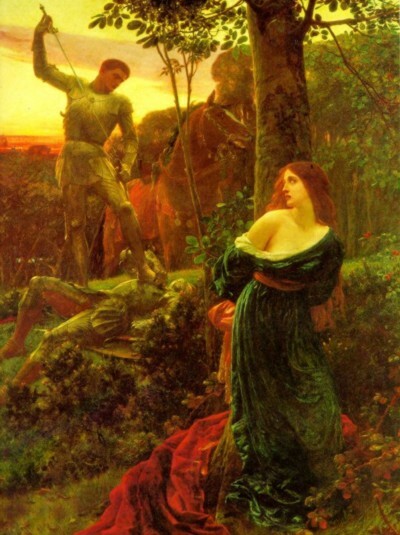 There is thus an apparent contradiction between ideal or practical chivalry—the only chivalry that matters, and which is the willingness to be held responsible for someone weaker or more dependent than oneself—and that other idea of chivalry which is modern, false and sentimental, and which practically amounts to a renunciation of any right to prevail over a woman, whether or not she be one’s spouse. How does the Englishman extricate himself from this dilemma? Very simply. He maintains his sentimental notion that it is not chivalrous or ‘the game’ to prevail over a woman, and is therefore committed to the necessary corollary of giving up responsibility. This is being done more and more, and even the law is being altered to make the change more complete and more effectual. Thus we have on the one hand, in the average married couple of the cultivated classes, a creature who eschews coming to grips, who renounces his right to have his way, because through some foolish misunderstanding of chivalry he feels it would not be ‘playing the game’ to have his way with a woman; and on the other we have another creature, woman, who, not being expected to be ‘chivalrous’ or ‘to play the game’, repeatedly gains the victory over her mate through the perma­nent advantage she possesses of being able to break rules that her mate feels bound to observe. She moreover knows that, just as he likes to be thought humorous, he also wishes to be considered what is vulgarly called ‘a sport’. And if he ever ventures to thwart her he is quickly brought to heel by being menaced with the immediate loss of his reputation for ‘sportiness’. When women want their way—and they usually will have it, if they are allowed—they are little concerned about ‘playing the game’. In fact they are not, as I say, expected to play it. Consequently, when they are confronted by a man whose pride lies in his ‘chivalry’, their victory is always assured. When, in addition, we remember that almost the whole of popular and learned opinion in England supports this insensate interpretation of ‘chivalry’, and that the woman feels this background of sympathy behind her, we cannot be surprised that guidance, responsi­bility and authority in the home, if not also everywhere else, [have] passed almost entirely into the hands of women. Frequently it happens—Gissing mentions an instance, doubtless drawn from life—that a woman may crave to be mastered; when, in the midst of a storm of tears, stamping of angry feet and offensive remarks, she may wonder why her man does not at last impose his will with violence, and half-wishes he would. When, however, one’s vanity lies in one’s good name for ‘chivalry’, one is induced to sustain it even at the cost of ignominious defeat, and thus too often a scene, which, if energetically handled, might consolidate the love of a couple, ends in building a barrier of strangeness be­tween them. For the woman, dissatisfied with and contemptuous of her alleged ‘chivalrous’ partner, does not forgive him for his lack of ordi­nary human skill in managing her, and, his ‘chivalry’ having tamed him, she dreams of the sheik who is still untamed. Hence the enor­mous popularity in England of all that class of fiction which depicts amorous commerce between Arab sheiks and white women. This so-called ‘chivalry’, too, is a sign of mental softening, for the man of strong character not only insists upon being chivalrous in the right sense—that is to say, responsible for his dependents—but he also wishes the essential correlative to that condition, which is the right to guide and to have his way where his responsibility is likely to be called to account.